The Archdiocese of Boston is the fourth largest archdiocese in the United States and is the spiritual home for more than 1.8 million Catholics. Since July 2003, Cardinal Seán P. O’Malley, OFM Cap., has led the Archdiocese through unprecedented events with a focus on healing and rebuilding the local Church. Centered in of one of the world’s great cities – Boston – and spread across 144 communities in eastern Massachusetts, the Archdiocese of Boston is an ethnically diverse and spiritually enriching faith community consisting of vibrant parishes, well performing Catholic schools that are educating more than 46,000 students annually and a social service outreach that is helping to assist more than 200,000 individuals each year. Mass is celebrated in more than twenty different languages each week. During the seventeenth and much of the eighteenth centuries Catholicism was illegal in Massachusetts. Not until the Revolutionary period when America needed the support of Catholic France did attitudes soften noticeably. The Massachusetts constitution, written in 1780 finally permitted Catholics to practice their religion. Even at that things moved slowly. Not until 1788, was the first public mass celebrated in Boston. In the next twenty years, however, the Catholic presence became significant enough to warrant the creation of the Diocese of Boston in 1808. Named as first bishop was Father Jean Cheverus, a refugee from the French Revolution. New England had few priests and suspicions toward Catholicism still ran high. Bishop Cheverus spent most of his episcopate in missionary work and in building good will. By the time Cheverus was recalled to France in 1823, many prominent Protestant Bostonians joined Catholics in petitioning the King of France to retain him as Bishop of Boston, alas to no avail. Cheverus returned to France and was sorely missed by Bostonians regardless of faith. The remainder of the nineteenth century brought with it heightened anti – Catholicism and suspicion toward foreigners. It fell to the Bishops of Boston to reconcile Catholicism with this often antagonistic environment. Bishop Benedict Fenwick expended great energy in missions, but also in communicating Catholicism to potentially hostile neighbors. Not ceding anything, but by debating with Protestant leaders and, ultimately, establishing a Catholic newspaper – now known as the Pilot, he explained Catholicism to outsiders. Notwithstanding acts such as the burning of the Ursuline Convent in 1834, Catholicism was in Boston to stay. By the time the nineteenth century ended, a huge influx of immigration swelled the ranks of Catholics in Boston. The Irish famine in mid-century followed by immigration from Southern Europe brought thousands of new Catholics to the Boston area. Bishops John Fitzpatrick and John Williams (later archbishop as Boston became an archdiocese in 1875), adopted strategies of conciliation and assimilation to smooth the way for Catholics. By century’s end Catholics made important advances in the social order, including the election of the first Catholic as Mayor of Boston. Archbishop (Cardinal 1911) O’Connell took a radically different tack on assuming leadership of the Archdiocese. Abandoning conciliation and assimilation, O’Connell insisted on confidently asserting Catholic identity. He worked assiduously to claim for Catholics their rightful place in both the religious and social milieu. O’Connell also began the work of expansion of the Archdiocese, a work carried to an even higher level by Archbishop, later Cardinal Cushing, bringing the number of parishes to the highest level it would reach, over 400 in the mid – 1960s. Expansion did not come without a price, however; Cushing’s successors inherited a debt that would stem some of the growth. In the late twentieth century Cardinals Medeiros and Law had to deal with a host of issues which disrupted Catholic life. It was a time of upheaval in most aspects of American life, and the Archdiocese was not spared. Social unrest and civil rights concerns sparked controversy within the Archdiocese. Schools and parishes were reduced in number as a result of indebtedness and falling attendance. After a period of stabilization lasting several years, Boston became, in the early twenty first century, the focus of abuse scandals which occurred across the United States. This left the Archdiocese arguably in its most difficult position since the anti – Catholic agitation of the nineteenth century. 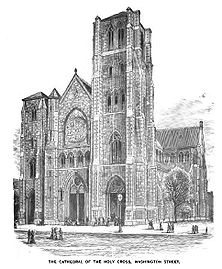 Throughout its history Catholicism in what is now the Archdiocese of Boston has encountered adversity, but it has always met challenges with strong faith and the dedication of its clergy, laity, and its leaders. Since 2003, the Archdiocese has been under the leadership of Cardinal Séan O’Malley. The ensuing years have become a time of healing, consolidation, and progress. In its two hundred years the Archdiocese of Boston has undergone much, but it has continued to flourish and today stands ready to meet its future.